Western North Carolina is best known for waterfall, mountains, and white water paddling. We've found numerous wonderful places for quiet water paddling with our kayaks Nessie and Clem. These paddles are peaceful alternatives to white water paddling and the hikes to waterfalls. I haven't found a book that covers the quiet water opportunities in the Western North Carolina. The spots we've found were discovered by asking other paddlers and by investigating the NC Wildlife commission boat ramp sites and by looking at North Carolina Maps and locating lakes. Many of the places we've paddled in Western North Carolina we paddled before we switched to digital so I don't have many photos of these trips yet. Scanning the many color negatives from these trips is one of the tasks I have to undertake. So for now, this section is basically a list of where we've been. Photos will follow sometime. Check to links in the side menu for information on some of the recommended locations. Many of the quiet water opportunities in Western North Carolina are due to hydro power dams built by various electric companies. 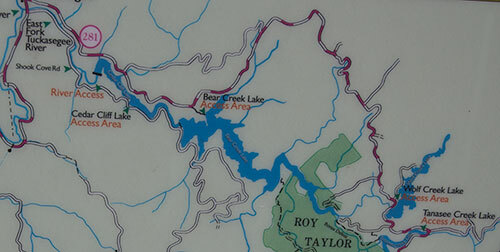 This is a map of some of these hydro lakes. Four lakes; Tanasee Creek Lake, Wolf Creek Lake, Bear Creek Lake, and Cedar Cliff Lake; provide a good starting place for exploring quiet water paddling in Western NC. The four lakes are close together and are well worth visiting. Bear Creek Lake is the largest of the lakes and has always been one of our favorite. Lake Fontana. Lake Fontana provides multiple paddling trips. It has many coves that can be explored in short trips. Paddling across parts of the lake also provides access to make hikes in Smoky Mountain National park. The last time we were there, we were adopted by a puppy someone had abandoned. Probably one of our most expensive paddling trips. Lake Hiwassee. Large lake with numerous coves that can be explored. Nantahala Lake. This is a pretty lake, but is more developed than we like. Lake Glenville also called Thorpe Reservoir. The best public access for kayaking is located at the north end of the lake off of NC Highway 107. The turn off is for Pine Creek Road. We like the access provided by Ralph Andrews Park. There is a campground at Ralph Andrews Park. See Lake Glenville Map for more information. Duke Power has greatly improved access to the lake and has a realy nice access further up the road from the Andrews Park access area. Julian Price Lake In July of 2009 we had a nice paddle on Julian Price Lake--a small lake off the Blueridge Parkway. This is in a completely different part of Western NC from the lakes above.